This content release introduces and showcases a raft of new features, all of which will be persistent in Sea of Thieves beyond Merrick’s story and its time limited campaign. 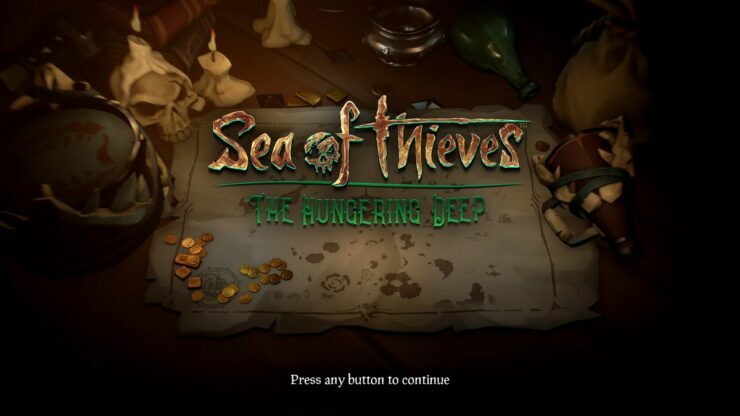 [Original article] Rare has made the Sea of Thieves Hungering Deep patch available for download on both Xbox One and Windows 10 PC. At the time of writing, the game’s servers are undergoing maintenance while the patch is being implemented. Servers are expected to be up at 2pm BST. The game’s first major content update weighs in at roughly 1.4GB, and adds new content to the game, including a special time-limited campaign, a new threat, drums, flags, and more. New Threat! Such a monstrous peril won’t be easily vanquished. The risk of encountering it out at sea will live on. Sea of Thieves is available now for Xbox One and Windows 10 PC. We’ll update as soon as the official patch notes for the Hungering Deep update are released.